The CARE II experiment launched on Sept. 16, 2015 and set a world record for most rocket engines used in a single flight. NASA and the Naval Research Lab have set a world record for the highest number of rocket engines used on a single flight: a total of 44 engines, which flew on a sounding rocket last year. On Sept. 16, 2015, a Black Brant rocket carried an experiment to study "dusty plasmas": an electrically charged mixture of gas and bits of dust that can occur naturally in the mesosphere (the region of the atmosphere about 30 to 50 miles, or 50 to 80 kilometers, above the surface). Thirty-seven rocket engines were used to create an exhaust cloud for the experiment. Three engines were used to launch the rocket, and the remaining four were used as spin motors to control its position. The experiment, called the Charged Aerosol Release Experiment II (CARE II), was led by Paul Bernhardt of the Naval Research Lab in Washington, D.C. NASA Wallops Flight Facility in Virginia oversaw the development of the experiment hardware. "Being recognized by Guinness World Records for this achievement is icing on the cake for the entire team. 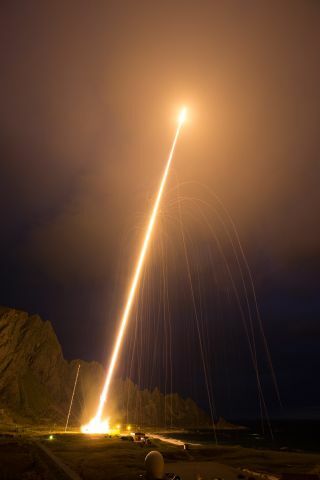 To successfully carry out this mission required great planning from everyone involved," said Phil Eberspeaker, NASA's office chief for the sounding rocket program, in a statement. The mission lasted about 10 minutes and flew as high as the ionosphere, about 186 miles above Earth. Scientists were able to create the dusty plasma by injecting aluminum oxide dust particles (among other compounds) into the ionosphere, where the dust was charged and created plasma particles moving at hypersonic velocities. Instruments on the rocket detected disturbances in the ionosphere and relayed the information back to scientific radars on the ground. NASA isn't expected to break the record again soon, but Chuck Brodell, vehicle manager of the sounding rocket program, left a small window of hope open. "You never know what's down the pike," he said in the same statement.